Tikal is one of the most accessible Mayan ruins in Guatemala and one of the largest it is also a UNESCO World Heritage Site so it is not to be missed if you are in the area. 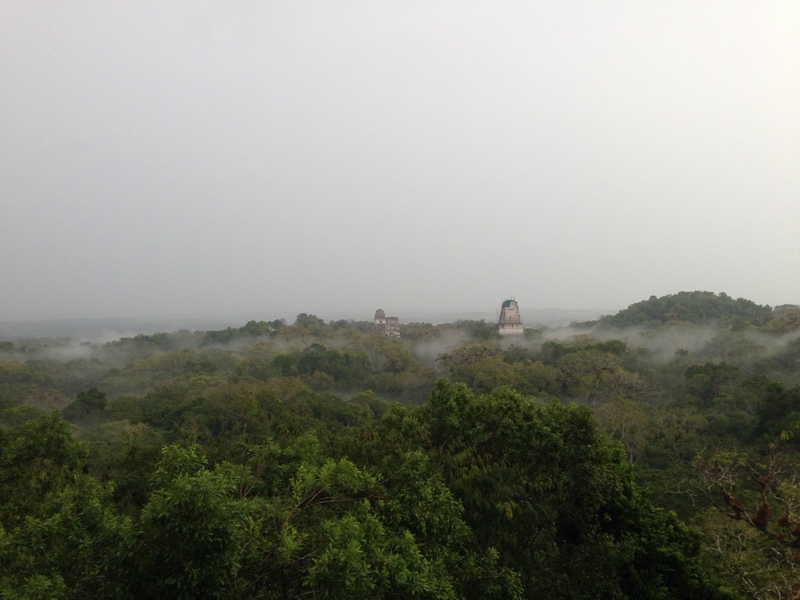 On a wet afternoon we visited Tikal as part of a guided sunset tour and because it was raining we almost had the place to ourselves which added to the atmosphere of this ancient site. However, it did mean we did not get to enjoy a sunset. Tikal is one of the largest archaeological sites of a pre columbian Mayan civilization. The site has an area greater than 16 square kilometers which includes over 3,000 structures. Due to the scale of the city it was only possible to see a small area which included the temples and structures in the main centre of the old city. Complex Q consists of two pyramids across from one another and is the largest complex of this type at Tikal. The complex dates from 771 AD. It is possible to climb the steps and get a better view of the place. Rear of Temple I. Temple I has a height of 47m. Temple I is located on the main plaza of Tikal was completed around 740/750 AD and has a total height of 47 meters. The temple is a funerary pyramid dedicated to Jasaw Chan K’awil, who was entombed in the structure. The Main Plaza was the centre of Tikal and it is an impressive sight. In the photo above Katie is looking towards the front of Temple I. Tip: Make sure you climb to the top of the higher structures, the views are amazing. From the highest one we climbed you could look out over the forest and see many structures emerging out from above. Take a moment, sit and enjoy where you are! High level of detail in the brick work. The above image was taken of what is believed to be a market structure. The high level of detail of the brick work suggests that Mayan’s we very proud of there commercial activities. Tip: Many of the structures within Tikal have a high level of detail within the brick work so make sure you stop and take a closer look. The above image shows the true scale of the structures at Tikal. We were impressed by the size of the temples considering how old they are. Tikal is a place worth visiting if you are in Northern Guatemala as it is an impressive sight when you consider the scale and age of the temples. We both enjoyed our afternoon here and felt that the rain added to the atmosphere of the place. Be warned on a sunny day it can be very hot here with limited facilities. Tip: Use the restroom at the entrance before you go in, there weren’t many options once you are onsite. There was also limited shelter from the weather. Our tour was organised through our hostel – Amigos Hostel, Flores. The hostel was really great and had a social atmosphere. What we also loved that once it got late the party moved into their sound proof night lounge which meant if you wanted you could either get a good nights sleep or continue the party. The hostel website provides different time options for visiting Tikal, this takes into account sunrise (get ticket in advance) and sunset. The tour included our transportation and an English speaking guide. You arrange your own entrance ticket on arrival. From Tikals gateway city, Flores we were able (again via the hostel) take a shuttle bus to Belize where we jumped on a boat and went to Caye Caulker. This looks spectacular, especially love the photos with the mist above the trees, amazing! Thanks! It is definitely a place to go visit if you get the chance.